P2P lending company Pertuity Direct, which launched in January this year, seems to go out of operation. A special meeting of the board of trustees of the National Retail Fund (the fund though which lenders invest in Pertuity Direct loans) took place “to approve the liquidation and distribution of all shares of the fund”. Currently it is unclear what this means to investors and if past borrowers will be affected in any way. Currently it is not possible for new borrowers to apply for new loans and new investors can not sign up on the National Retail Fund website. I’ll try to reach (former?) Pertuity Direct employees to comment on the situation and review the situation further. The campaign runs at affiliate network CJ, where Lending Club does administrate it’s affiliate program, too. Lending Club pays 35 US$ commission for each loan application and 60 US$ per lender registration plus performance incentives. See earlier posts about p2p lending services using affiliate marketing. Pertuity Direct – where is the p2p lending part? How is this related to Pertuity Direct? Pertuity Direct is a separate entity and is one of the fund’s service providers and acts in an administrative role. They underwrite and originate borrower loans. Those loans are an investment option for this fund. Where is the ‘Social’ aspect in all of this? If you choose, you have the option to engage in the social lending network associated with the borrowers within the funds. By selecting the option, you will be able to see the various borrowers in the funds, get to read their stories and track their progress over time. You will also have the ability to engage directly with any borrower or group of borrowers that you find compelling and help them accomplish their goals with a rewards program. Lenders can use so called Pertuity Bucks, which they receive free upon sign up, to reward borrowers whose stories they find compelling. 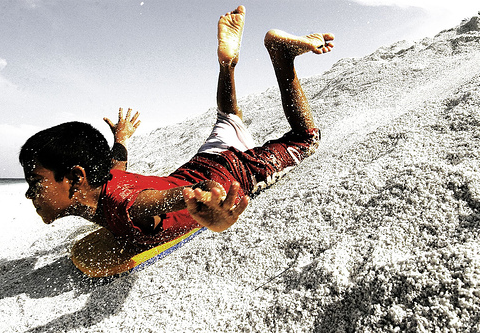 The balance of the borrower is reduced by the amount of Pertuity Bucks the borrower receives. While it may be a smart construct in respect to overcoming regulation hurdles it offers much less direct peer to peer interaction between lender and borrower. But let’s see how the concept develops and what borrowers and lenders think about it. What is your take on this, dear reader? The new p2p lending service PertuityDirect.com is now online. The concept Pertuity Direct uses is new. Lenders pay into the “National Retail Fund” which is a “social lending mutual fund”. If I understand the concept correctly, you do not choose individual borrowers you want to lend to, but rather a group of borrowers with similar parameters by buying share of a fund – but if you want to, there is the option for individual selection (similar to Lending Club). Have not grasped yet how the individual selection is supposed to work when you by shares of the fund? The initial minimum investment amount is 1,000 US$ per lender. A so far unheard feature is that it Pertuity Direct allows early withdrawel of funds by lenders (2% withdrawal fee for withdrawals in first year of investment). Another new feature I found while reading the multiple page fund prospectus, is that lenders can set up an automatic investment plan, making monthly or quarterly investments. Interest rates of the loans are set in the range from 8.9% to 17.9%. Pertuity Direct accepts only borrowers with a FICO credit score of 660 or higher. Update: In fact the prospectus of the National Retail Fund II states that Pertuity will invest over 80% of the money in loans whose borrower’s have a credit score of at least 720. One advantage for borrowers is that – if approved – they get the loan faster than on other p2p lending sites, since there is no bidding or auction just the evaluation and approval process. Pertuity claims that typically borrowers will receive the money within 2 – 3 business days. Currently, the first year expense estimate is 3.17%, or $32 a year for every $1,000 invested. Fees are estimated based on the aggregate size of the fund. This estimate assumes a monthly average fund size of $12 million during the first year. 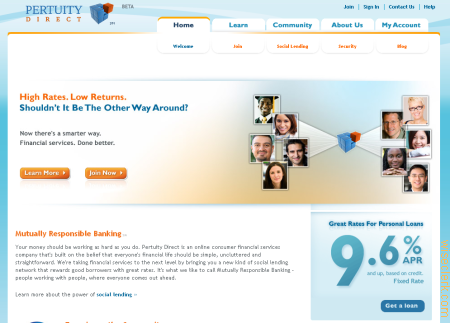 Pertuity Direct’s Social Lending Network is different from anything else in the market. The social lending networks we are building will expand to specific affinity groups borrowing from and lending to each other; for example, professional associations like doctors and firefighters, small business owners in specific geographic regions, and university alumni groups etc. We call it Mutually Responsible Banking. Learn more about Pertuity Direct’s Social Lending Network here. Our team is comprised of executives that have collectively worked in the U.S. financial services arena for a few decades with companies like Capital One, E*TRADE and PNC. We have executives who have experience building innovative and scalable web-based financial products, executives who have managed consumer credit and multi-million dollar loan portfolios, as well as brilliant engineers and systems architects. Our team is dedicated to changing the consumer finance landscape and loves to be on the cutting edge of financial innovation. … If you have been keeping tabs on the space, you know that the social lending industry has been pretty interesting over the last two to three months. The guidance that regulators have given with regard to the segment, combined with the fact that consumer loans are still hard to come by, fits perfectly with what we are bringing to market. There is a real need for alternative sources of capital for consumers, as well as new and better investing options. Social lending is a great answer to the problem – and Pertuity Direct is poised to bring it to the mass market. Since the Loanio delays I am a bit wary of launch dates, but ‘immediately after’ sounds confident – looking forward to the launch in January 2009 then.